MIAMI — Aaron Gordon and the Orlando Magic added to Miami's rising level of frustration. Gordon had 16 of his points in the third as Orlando outscored Miami 30-12, the Magic turning what was a four-point halftime deficit into a 14-point lead. Most Miami fans started heading to the exits with a few minutes left, and Heat centre Hassan Whiteside left for the locker room with 40.5 seconds remaining. "Probably extremely upset, like we all are right now," Heat coach Erik Spoelstra said, after his team dropped to 9-14. Whiteside wasn't available for comment after the game. A team official said Whiteside went upstairs to the team's practice court after the game to shoot free throws after going 0 for 2 on Tuesday — dropping him to a staggering 4 for his last 28 from the foul line over the last six-plus games, a 14.3 per cent clip. His free throws aren't why Miami lost Tuesday, but merely just one of many things going wrong for the Heat right now. "I thought our offence just stunk tonight," Heat guard Dwyane Wade said. Miami had won two straight, but Wade said the same approach that the Heat had in those victories over New Orleans and Utah wasn't there against Orlando. "It didn't feel like a game," Wade said. "It didn't feel like the last two games felt, when we needed wins because we were struggling. After winning two, I felt like we relaxed for some reason, like we've got enough wins around here. We've got to go. It's go time, man. You don't want to get too far behind." "We just picked it up on the defensive end," Gordon said. "Stops on the defensive end, playing the whole court and being aggressive." Justise Winslow scored 14 for Miami, which still hasn't had a three-game winning streak this season. Kelly Olynyk scored 13, Whiteside had 12 and Wade and James Johnson each added 11 for the Heat. Miami was only 2 for 5 from the foul line in the game, as opposed to Orlando's 15 for 20. The two free throws made in a game tied a record-low in Heat history, and the five attempted ties for the second-lowest. The Magic were 1-10 this season in games in which they weren't winning at halftime, but outscored the Heat 30-12 in the third quarter to grab control. It was Miami's lowest-scoring quarter of the season — one point less than its opening quarter against Brooklyn on Nov. 20 — and the worst quarter the Heat had against Orlando since an 11-point third on Feb. 8, 2012. "It's our inability to sustain," Spoelstra said. "That's it. ... There's a flagrant inconsistency that we keep bumping into." Orlando held the Heat to 24 per cent shooting in the third (5-21) and the Magic didn't commit a turnover in the period. 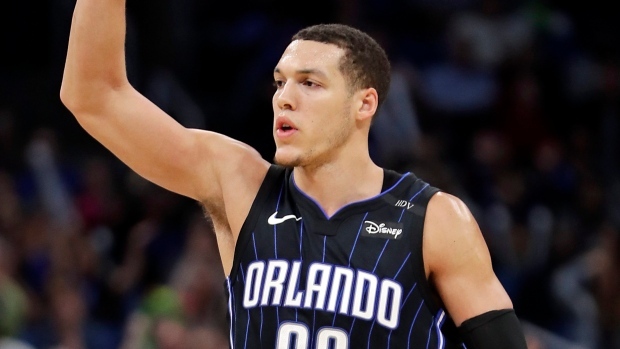 "Obviously Aaron Gordon was tremendous in the third quarter, both his offence and the defence," Magic coach Steve Clifford said. "Our defence was better and they missed some open shots also." Heat: Tyler Johnson returned after missing six games with a hamstring strain. Goran Dragic (knee), Derrick Jones Jr. (hamstring) and Dion Waiters (ankle rehab) remained sidelined. ... It was Miami's last home game until Dec. 20.